Rolling out a telemedicine program for your office might seem like a daunting task, but it is actually rather straight forward. We’ve worked with many providers and we can share the path that the most successful of them have taken. Practices offer the option of visits via video for a number of reasons. It can be an effective way to reduce costs, increase revenue, protect against competitive threats and offer more flexible service to patients. Whatever your reasons for embracing telemedicine, make sure that they are well understood and that, where possible, measurable goals are defined. How much do you expect to save? How many more visits a day do you hope to complete? Getting started with telemedicine isn’t difficult, but it will require the input of providers, staff, and other business services, like marketing, if applicable. We find that most practices benefit when they create a small implementation team and designate one person as the main point of contact for the project. That coordinator is responsible for making sure momentum doesn’t stall. Your telemedicine program will lose steam quickly if it isn’t utilized. It is important to educate your staff and patients about the value of telemedicine and when and how it will be used in your practice. A bit of marketing will be necessary to make sure that everyone knows it is available and when to offer or request it. With cloud-based solutions, the actual implementation is the easiest part of your rollout. If you’ve selected a solution that integrates with your EHR, and you should, that will need to be configured and tested. Your patients and staff can provide valuable insight into how well your telemedicine program is working and what can be done to make it even better. Be sure to have an easy and closely monitored way for them to provide feedback. Have regular conversations with staff, and act on good suggestions for improvement. Check in with your goals from time to time to make sure that you are getting the results you wanted. If you aren’t achieving them, determine what changes can be made or consider that the goals may have been unrealistic and need adjustment. 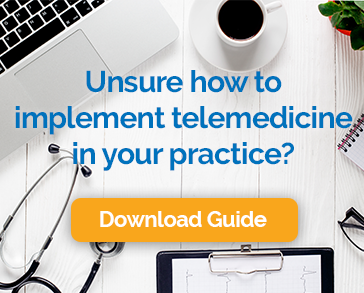 As with any undertaking of this scope, thoughtful planning is the key to successfully introducing telemedicine to your practice. By following these steps and being flexible enough to make adjustments as needed, you and your patients will be enjoying the benefits of telemedicine in no time. Interested in offering video visits in your practice? Getting started with Chiron Health has never been easier!